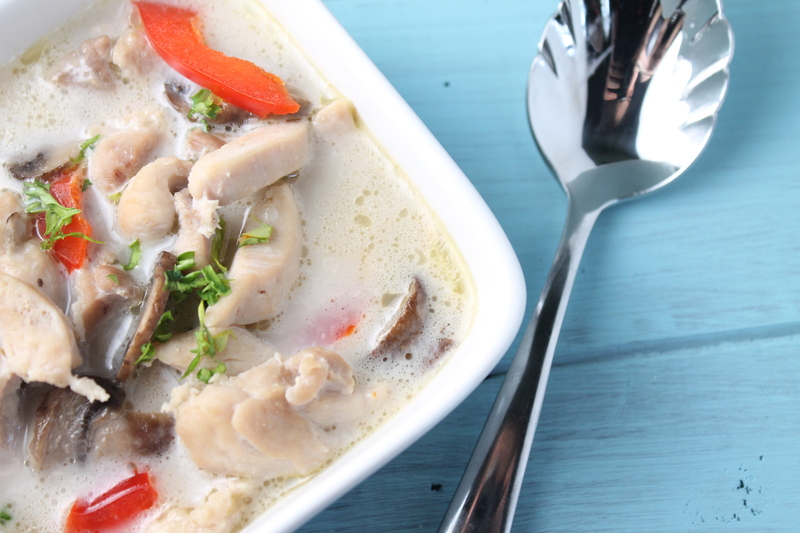 In less than 30 minutes, you can make this paleo, keto, and Whole30 Thai chicken soup just like your favorite Thai restaurants! With all your favorite flavors, this dish will be asked for again and again! This is one of those meals that you can’t believe takes so little effort and tastes so darn good. Thai food has always been one of my favorites, and all the flavors shine in this recipe. On the table in under 30 minutes, busy moms will appreciate the ease of preparing this soup. I like that I can keep it low carb, or add noodles for my kids if I want to! IF you choose to to add noodles, I recommend boiling the noodles separately, but al dente or slightly undercooked. You then add the noodles to individual bowls and pour the hot soup over them. If you store noodles with the soup, they will get too soggy, so store them separately…that is IF there is any left!! Like soup? Here are some more to try! 14 oz coconut milk this is my very favorite brand as it has no fillers/thickeners and amazing coconut cream! 2 cups sliced mushrooms I usually do a mix of cremini and shitake! 1 tablespoon fish sauce my favorite brand!! Lots of veggies would make a good addition to this soup..I love sweet peppers! 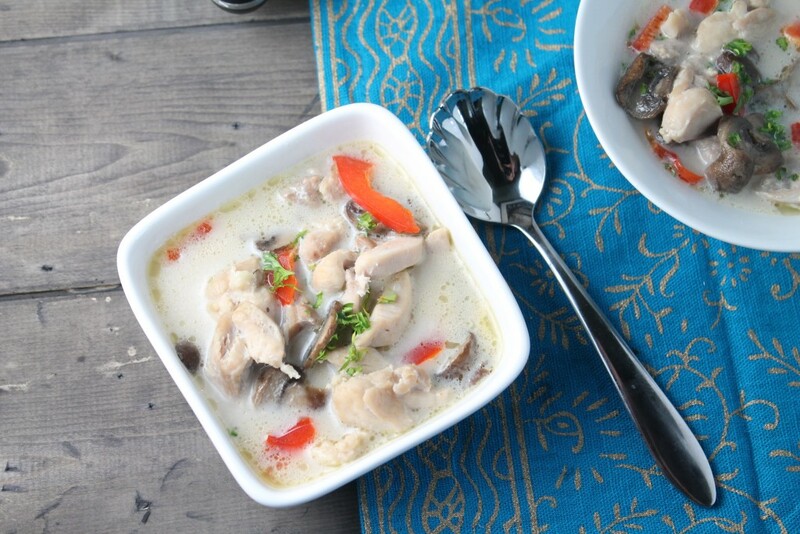 In a soup pot, bring the coconut milk, chicken broth, ginger, and lemongrass to a boil. Add the chicken and mushrooms and simmer until cooked through, about 10 minutes. Remove lemongrass and ginger slices. Add the remaining ingredients, more or less as you prefer!! Enjoy! Yum! I LOVE Thai food. This looks so fabulous – thanks for sharing with us at Savoring Saturdays! Looks so healthy and hearty. Would be great for a cold Winter’s day. I love the idea of using coconut milk. Thanks for sharing on Real Food Fridays. Pinned & twitted. Looks delish! I don’t have much experience with thai food, but this looks like a great recipe to branch out with! I’ll use turkey instead of chicken. Yum! 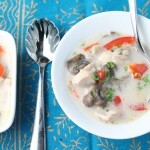 I love all the wonderful layers of flavour in this Easy Thai Chicken soup. It looks wonderful too! What a beautiful dish! Got it pinned! 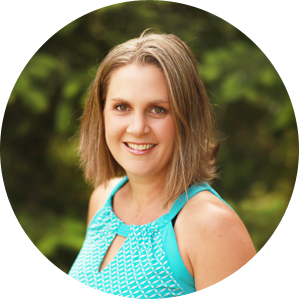 Thanks for linking up at Gluten Free Fridays! Your Thai Chicken Soup looks delicious. Hope you have a great weekend and thanks for sharing your tasty recipe with Full Plate Thursday. I love that this is paleo, Tessa. I’ve already pinned it to my soup board. Thanks for sharing. We love this recipe Julie…hope you do too! !